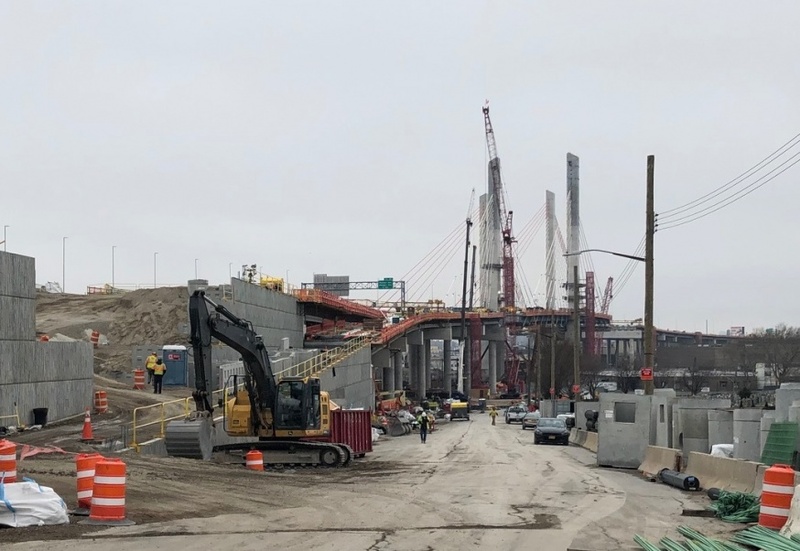 The second span of the Kosciuszko Bridge will open later this year and will feature a 20-foot-wide path for cyclists and pedestrians in both directions, providing a key link from Brooklyn to Queens. 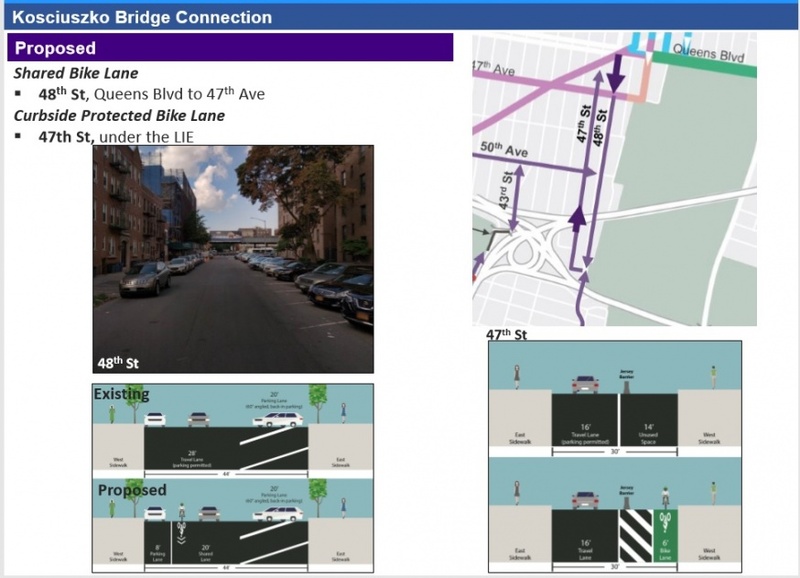 The DOT is looking to expand the bicycle network from the bridge to Queens Boulevard and is working on redesigning some key roadways. 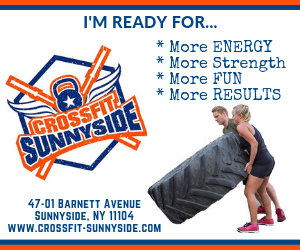 Changes will be made to 48th Street, 47th Street, 50th Avenue and a small portion of 43rd Street—all south of Queens Boulevard. The DOT said that no parking spaces would be removed as part of the redesign nor would it lead to increased congestion. The redesigns, however, would result in the narrowing of travel lanes, the agency said, but the roadways are currently wide enough that the change should have limited impact. 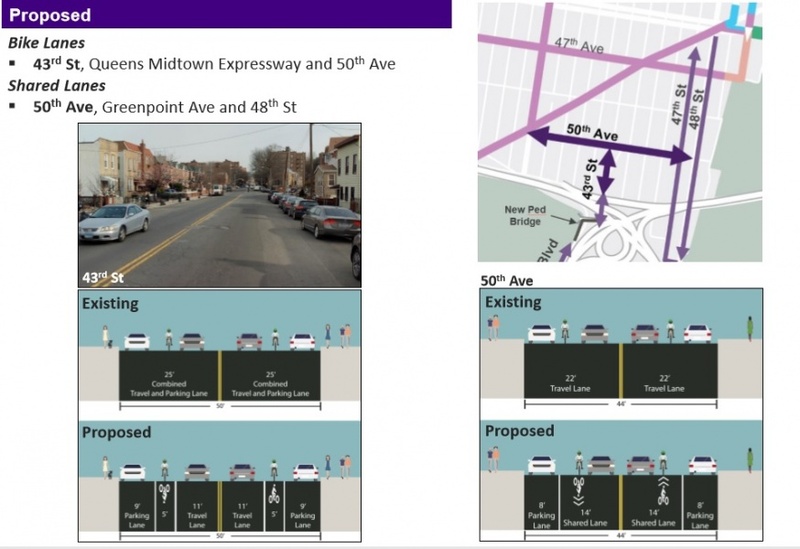 The most complex part of the redesign is taking bicyclists from the Kosciuszko Bridge to where 43rd Street and the Queens Midtown Expressway meet. 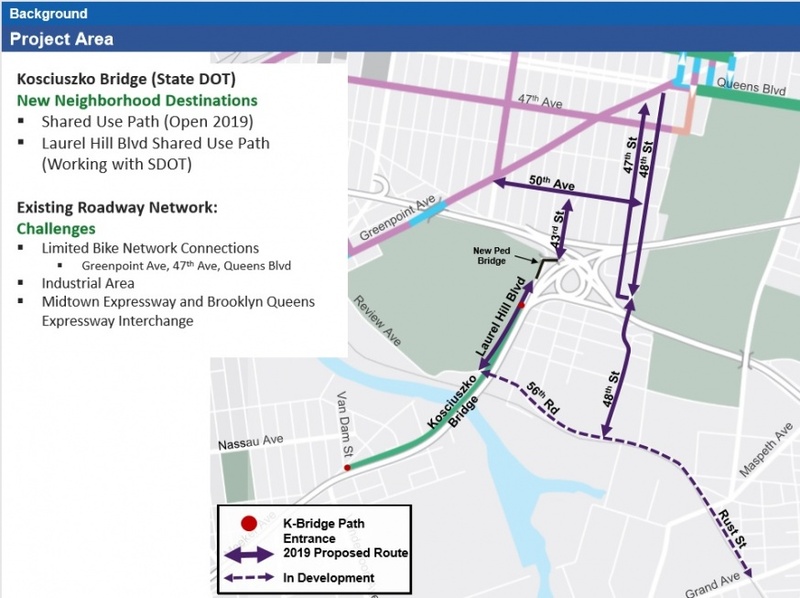 “There is a limited bike network there now,” said Craig Baerwald, a DOT project manager told the Queens Community Board 2 Transportation Committee last week, noting that it is in a very industrial area punctuated by the BQE and Midtown Expressway. 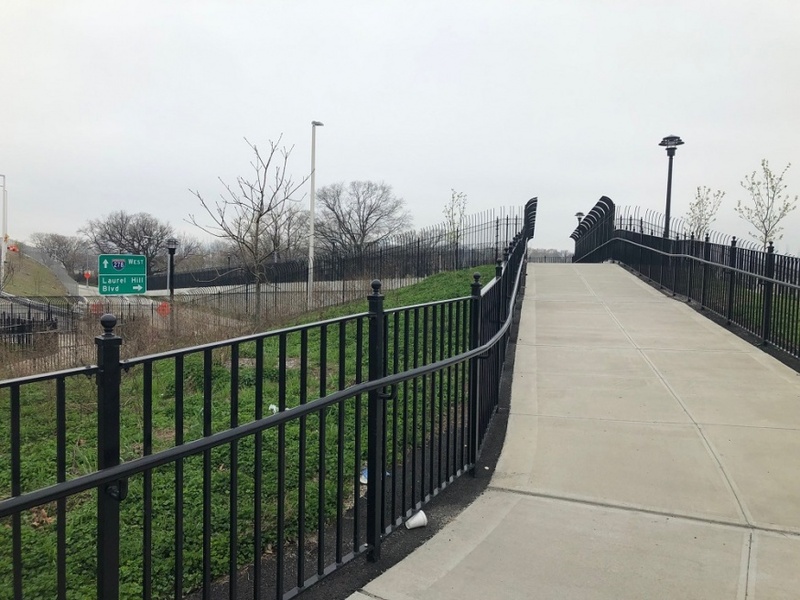 Starting at the Kosciuszko Bridge, the DOT is proposing turning the current staging area on Laurel Hill Boulevard between 54th Avenue and 56th Road into a bike/pedestrian path that connects to an existing pedestrian bridge. 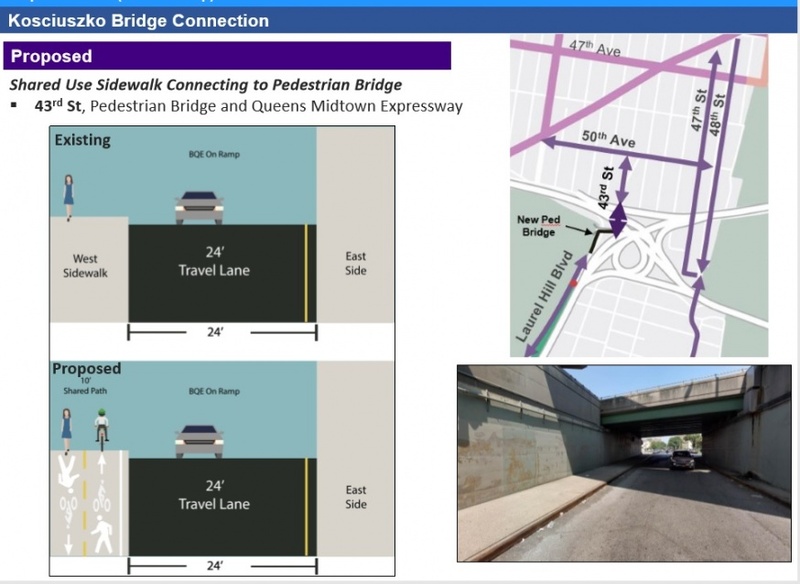 The DOT would then create a shared use sidewalk that leads to the pedestrian bridge underneath the Midtown Expressway. Once on 43rd Street, the network would involve designated lanes for bicyclists and motorists to share the roadway. The city plans to install a painted bike lane on 43rd Street between the Midtown Expressway and 50th Ave on both sides of the street. This involves converting a 25-foot combined travel and parking lane–into an 11 foot travel lane, 5 foot bike lane and 9 foot parking lane. This change would take place on both sides of the street. On 50th Avenue, the street is narrower. 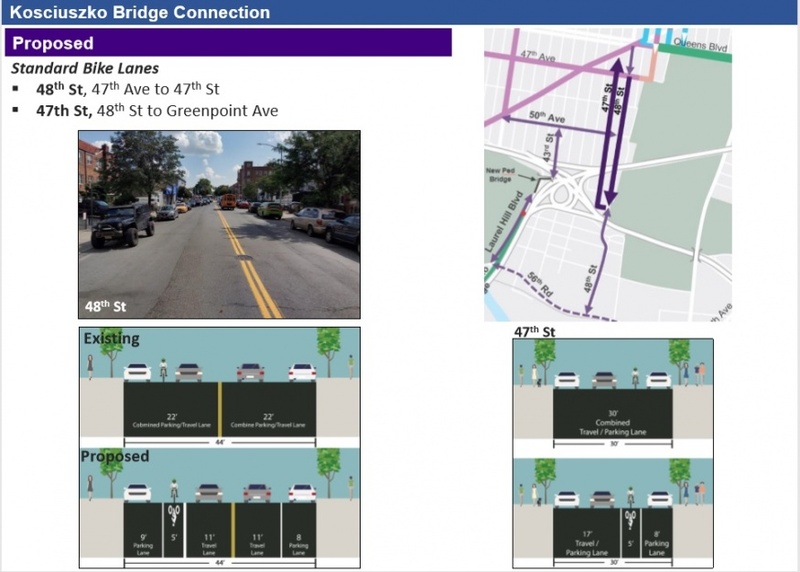 From Greenpoint Avenue to 48th Street, the DOT plans to change the 22-foot combined travel and parking lane into a designated 8-foot parking lane, and a 14-foot share lane. This would be on both sides of the street. 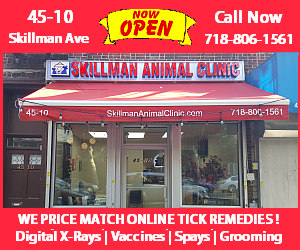 The bigger changes take place on 48th Street between Queens Boulevard all the way down past the expressway where 48th Street meets 47th Street. On 48th Street, which is two-way street except between 47th Avenue and Queens Boulevard, the DOT plans to add a painted bike lane for south-bound cyclists down to 47th Street. There will not be a northbound bike lane on 48th Street for this stretch. The tiny strip on 48th Street between 47th Ave. and Queens Boulevard—which is one way—will be tweaked to make room for south bound cyclists. 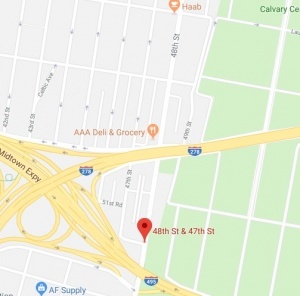 Bicyclists who are riding toward north, from the bridge toward Queens Boulevard, will be directed to 47th Street, a one-way street. The roadway will be tweaked to include a 5 foot painted bike lane. Great news! the city needs to continue promoting and enabling bicycle transport, especially since the MTA is such a mess. 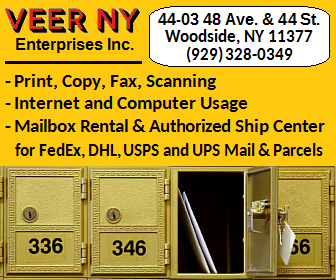 As a resident of 43rd street for well over two decades, I have seen the number of FATAL collisions that occur on the corner of 43rd Street and the Queens Midtown Expressway, the service road that leads to Hunters Point. With this ‘flawless’ redesign, not only are you going to make it increasingly difficult for tax paying residents to maneuver out of their driveways safely, which is already an issue, due to the influx of traffic 43rd Street has seen over the last few years, but you are creating a path into an extremely dangerous area. Without proper repercussions for cyclists failing to follow traffic laws, this intersection is going to be a catastrophe. In the end, it doesn’t matter. Most likely a scheme to boost property value, but it’s important to ask, at what cost. If I hit a cyclist, someone will take my plate, make and model. I will have police waiting at my door. If a cyclist hits my vehicle OR my person, as a pedestrian, I will get (and have gotten) the finger and a few choice words. This is what property tax gets us? What a joke. Describe the suspect. He was a white guy with a blue Huffy…Yeah, goodluck with that. You’ve personally seen fatal bike accidents over two decades and never called the police?! This is great! Hope they’ve similar plans for cyclists once you reach the other side. We also need better cycling facilities on the south side. Not fair that the north side gets protected lanes and the south side gets paint. Rust-56-review-Borden could be a 10-15 ride to hunters pt park south, the ferry, and the 7 train. Right now it’s a death trap by the cemetery and factories. This is great news, but I’m most interested in learning more about the “in development” part on 56th/Rust (the dotted line in the first map). That route is the fastest way to many parts of Brooklyn, and not nearly enough people know about it. Takes me about 25 minutes to get to Bushwick, versus 70-90 on the subway most weekends with the multiple transfers and construction. Adding actual bike routes will get more people to realize how much better is is to get around. I am having an issue with the fact that the cars stop at the red light but the people in the green lane just keep on riding. So when you think you can cross the street you really can’t because you got some guy on a bike that is not stopping. This has happened to me twice already.. I think the bikers really need to abide by the same rules as the cars. And never mind the ones that are still riding on the sidewalks….next to the bike lanes?!!! It is true that many cyclists do not stop at the stop sign / red light. I stop at every one however. People ride their cars through the bike lanes all the time. And drive recklessly. By the same logic,should we remove all traffic lanes for cars as well? 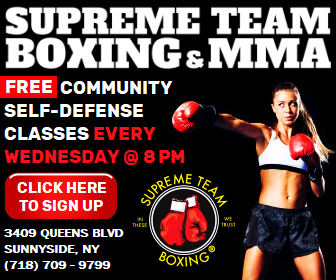 A definite advance for the people of NYC. Another redesign shoved down our throats. Drawing lines on the road does not make it safe for bikers. Does drive license test have any question about bikers or right of way or anything like that? Like I ask you guys does any biker know not to keep riding when a car has right blinker and waiting for pedestrians to clear the cross walk? Because if you don’t that’s how you die, trying to pass a turning truck on their right. 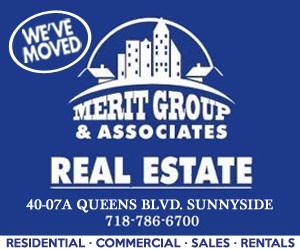 Same thing on Queens Blvd / Service Road mergers. I wish I had the time to just sit there and record how many times bikers blow the red light and keep driving when the cars have the light. Are you against lane markers for cars too? The DOT stats show that bike lanes save lives. You are missing the forest from the trees. Another low IQ person. This is such WONDERFUL news! I’ve been waiting for bike access across the Kosciusko, and it’s finally going to arrive! THANK YOU DOT!!! 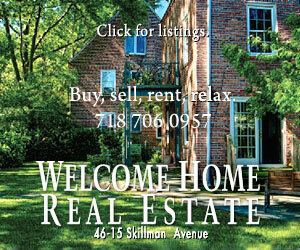 All you Simply have to do is “Hike” down Greenpoint ave…Perhaps in your case you can try swimming across the canal!! 48th Street is incredibly dangerous; drivers speed recklessly from the expressway to Queens Blvd and the truck traffic is considerable. That’s added to the double-parkers and idlers who clog the street and make these “overly wide” lanes not exactly wide. I hope DOT’s changes make the street safer for all, but in order to do so, I would encourage the city to consider adding more traffic enforcement– why not set up speed traps there, ticket double-parkers, and find ways to discourage idlers? I fully support making room for cyclists on the road, because that in turn can help pedestrians, but I also hope to see more supportive changes to go along with it. Pushing trucks and cyclists together on 48th Street without additional safeguards could lead to some bad situations. 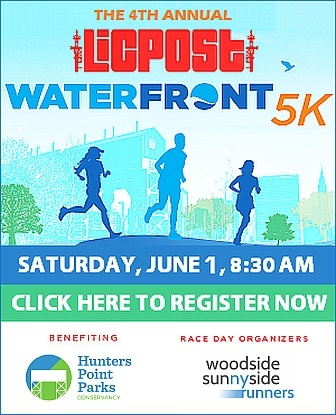 I’m looking forward to biking over the Kosciuszko Bridge. 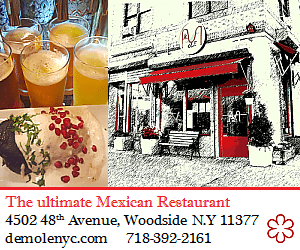 I understand they pronounce it somewhat differently than we do over here in Queens. This should be interesting. Yeah, good luck with that. Residents and businesses south of QB need to ask a lot of questions now before the “flawless” design is set in stone. I was crossing in midtown, in the crosswalk and with the light in my favor. Along comes a very busy bike messenger, (“VBM”). Oh so busy he couldn’t stop for a mere pedestrian so he hit me and when I yelled at him while lying on the pavement, VBM found the time to flip the bird at me. Too many cyclists do whatever the heck they want and pedestrians are the losers. Flame away cyclists, I know how you act and don’t give a bleep what you think. I think you mean flat. One does not flaunt a law, although you could flaunt your fancy new bicycle while flauting the law.